Until recently, we didn’t think that Meghan Linsey’s hair could get any better. That was before the ACM 2012 awards show, where Meghan wore a sparkling headband. We just had to find out where the accessory came from. Turns out it’s a SUNNYband, and that Meghan has been a longtime fan. In fact, the night of the ACMs, Meghan tweeted: “Thank u @sunnyband for the beautiful band! AND for helping me get ready!!!!! Love u girl.” The Steel Magnolia singer follows SUNNYband on Twitter, and often checks in to see what’s new. The headbands and jewelry are handmade, making them totally unique. But more than that: they’re a chance for every girl and woman to bring out her individual personality or style! Some of the bands are even more unique with the look of a hat such as the one Meghan’s wearing at left. Another country music singer has her own line. 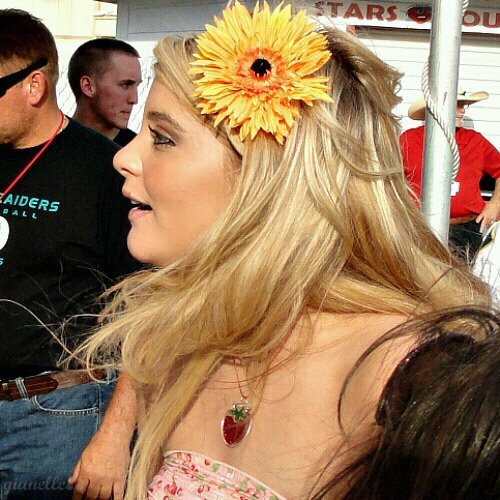 It’s the Signature Lauren Alaina Wildflower headband. Lauren is the runner-up of American Idol in Season 10, and she’s touring with Jason Aldean. One of Ms. Alaina’s custom bands is an “ICED” look, completely covered in Swarovski crystals. You can find everything from high fashion to subtle simplicity to something wild at sunnyband.com. Sources: sarakaussmusicians.com, Judy Eddy/WENN, SUNNYband. This entry was posted in Celebrity Hairstyles, Celebs, Country Music star hairstyles, Music, star hairstyles, star styles that work in real life and tagged American Idol hairstyles, celebrity hairstyles, Country Music hairstyles, Lauren Alaina's hair, Meghan Linsey's hair, Steel Magnolia's Meghan Linsey, Trendy headbands. Bookmark the permalink.